Russian President stresses to Netanyahu the importance of Iran deal. Russian President Vladimir Putin on Monday stressed in a conversation with Prime Minister Binyamin Netanyahu the importance of continued observance of the 2015 Iranian nuclear deal. "Vladimir Putin reiterated Russia’s position that the JCPOA, which has a paramount importance in terms of international stability and security, must be strictly observed by all its signatories," the Kremlin said, according to the Russian TASS news agency. 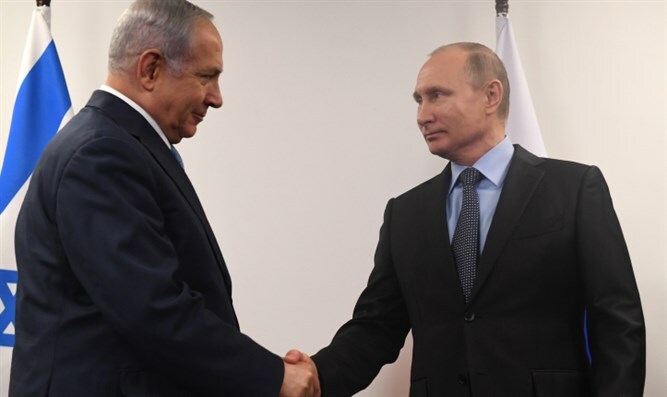 Putin and Netanyahu also discussed the general situation in the Middle East, including the developments in Syria, and agreed to continue personal contacts. The conversation was initiated by Israel, added the Kremlin. Netanyahu spoke with Putin, as well as with other world leaders, following his presentation on the Iranian nuclear program. In a televised address before the calls, Netanyahu said that "Iran lied big time" when its leaders denied that the Islamic Republic had a program to develop nuclear weapons. The Prime Minister noted that after it signed the nuclear deal in 2015, Iran intensified its efforts to hide its secret nuclear files. He also pointed out that “in 2017, Iran moved its nuclear weapons files to a highly secret location in Tehran". Trump has set a deadline of May 12 for Europe to fix the flaws of the 2015 Iranian nuclear deal. While Trump praised Netanyahu’s speech and said it "sends the right message" on Iran's nuclear program, he would not say whether he plans to withdraw from the agreement.